Unless you’re a middle-aged human with a very young parrot, the odds say that you will outlive your non-human ‘baby’. Their too-short life span can be heart-breaking, but it’s also what makes sharing our lives with pets so poignant. 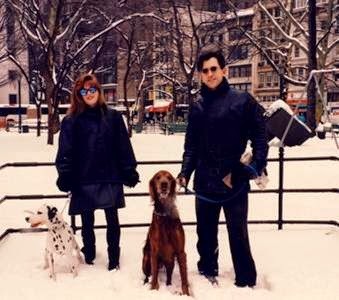 In recent months, several friends have had to face this bittersweet reality: Jenniene, who lost her beloved Poodle, Stella, and her bird, Hymmie; Rob and Diane, who lost their canine boys Griffin and Sonny; and Craig,who just lost his best pal, Bud, an amazing Visla-mix. Almost anyone who’s lost a treasured pet will tell you that the grief we feel at their passing is genuine, and sometimes greater, than when our human friends depart. But do our pets mourn for us, or for each other? We’ve all heard stories of incredible canine feelings, but perhaps none tops that of the Japanese Akita, Hachiko (made famous in the movie Hachiko, A Dog’s Story). 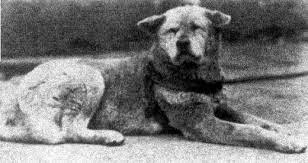 Following his owner’s sudden death in 1925, Hachiko returned to the train station, where he used to welcome him home, every day for next ten years. In the opening chapter of GIMME SHELTER, we recount how, when we lost our Irish Setter, Rebel, we were so devastated that it took a year before we’d recovered enough to retrieve his ashes from the vet’s office. At the time, we doubted that his doggie sister, Roxanne, aka ‘The Dalmatian From Hell’, would even notice his absence. After all, her waking hours had seemed devoted to stealing his toys, usurping his place on the sofa, and making his life miserable. We were wrong. The day Reb passed, her usually perky tail hung straight down, like an antenna that had snapped in the wind. Her normally ravenous appetite was gone, and her non-stop barking muted. She carried on this way for several weeks before eventually returning to her terrible self. In an earlier post, we mentioned the work of neuroscientist Gregory Burns which makes the case that “Dogs Are People, Too‘. Now dog guru Cesar Millan offers some insights in Dogs Mourning Humans.